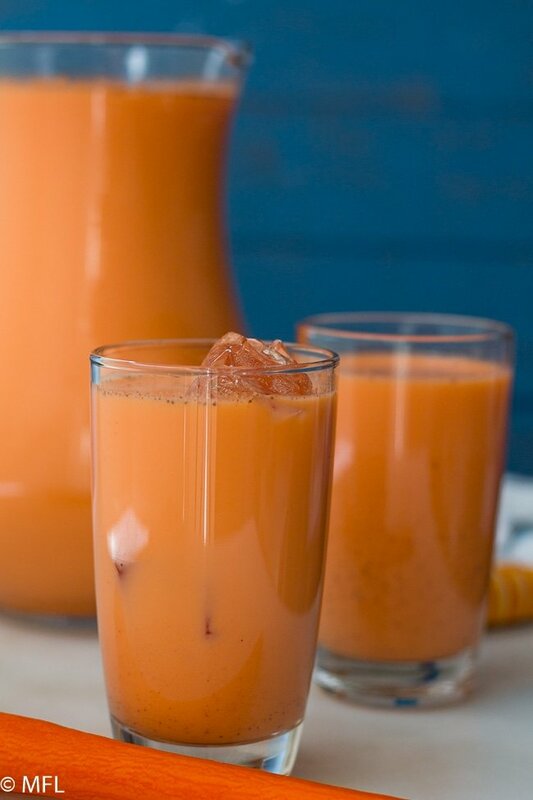 This Jamaican Style Carrot Juice Recipe is a refreshing yet sweet treat. One of my favorite drinks when growing up in Jamaica. This post may contain affiliate links, you can find my full policy here. Growing up, carrots were one of my favorite vegetables to eat. Not the cooked carrots, but a regular raw right out of the bag carrot. I’d grab one, sit in front of the t.v. watching my cartoons, and chew on the carrot. Basically, I wanted to be Bugs Bunny. A little birdie also told me that carrots were really good for eyesight so as a kid, I made sure I ate at least 2 a day. I still don’t need glassess…I’ll give props to the carrots and that little birdie. 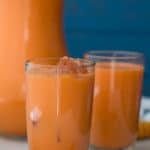 Growing up, while I wasn’t eating all the carrots in the house, I would also get to enjoy this Jamaican Style Carrot Juice. It wasn’t made too often in the house, but when it was made, it was a true treat. 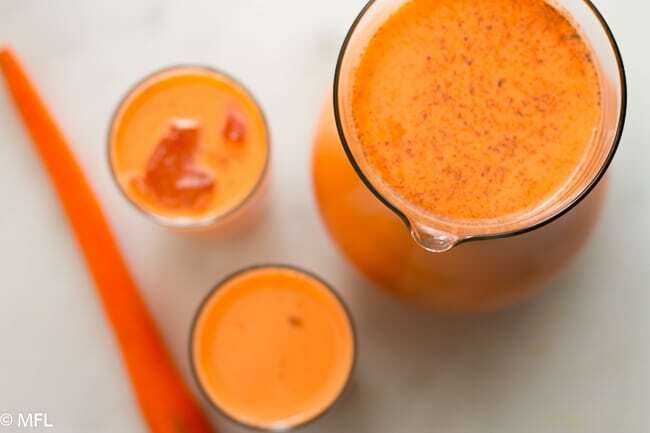 Now this isn’t your typical carrot juice recipe…it’s a bit thicker and sweetened with condensed milk and other spices. So in other words, it ain’t the healthiest drink on the block. But seriously, who cares, it’s delicious and it does have a vegetable in it. This drink is pretty sweet depending on how much condensed milk you add. 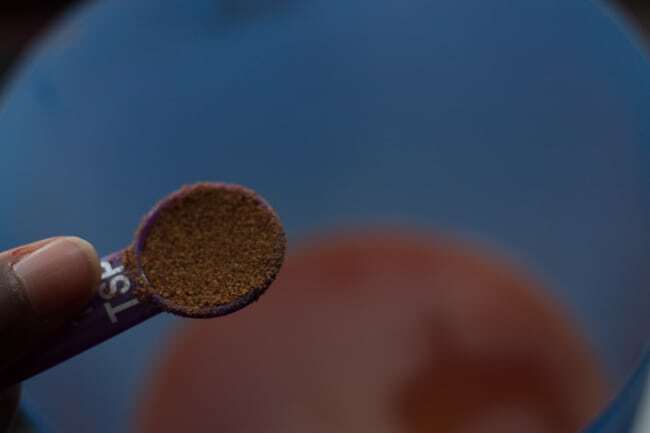 However, the other spices give it a spice filled taste. 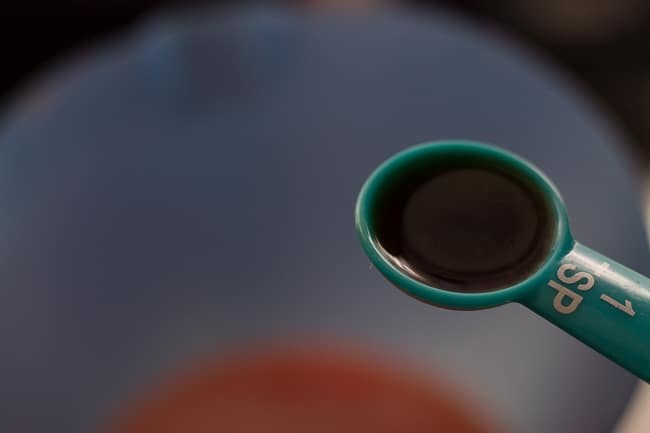 Sometimes, I like to act a little grown and add some dark Jamaican rum to this Jamaican carrot juice recipe. It gets gone a little quicker when I do that. 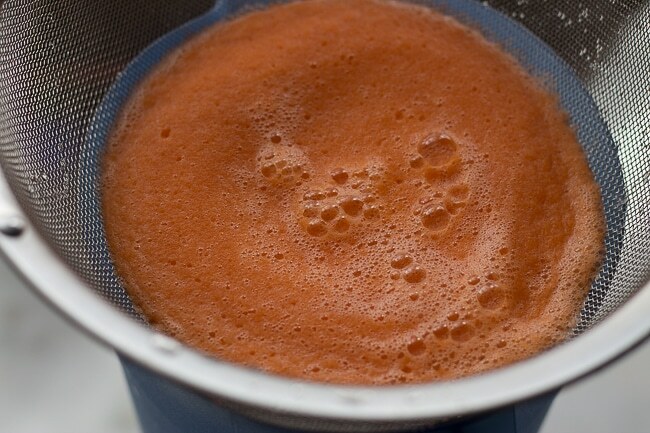 This Jamaican Style Carrot Juice Recipe is a breeze to make. 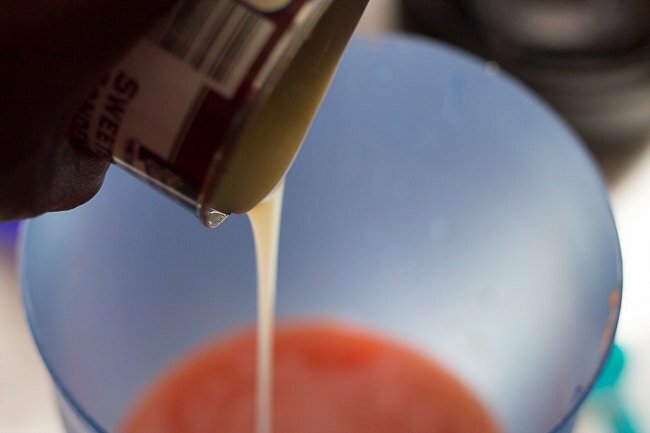 All you need is a blender, a strainer , a bag of carrots, a can of condensed milk, vanilla extract, and nutmeg. Serve it over ice for a nice refreshing drink. Ya mon. 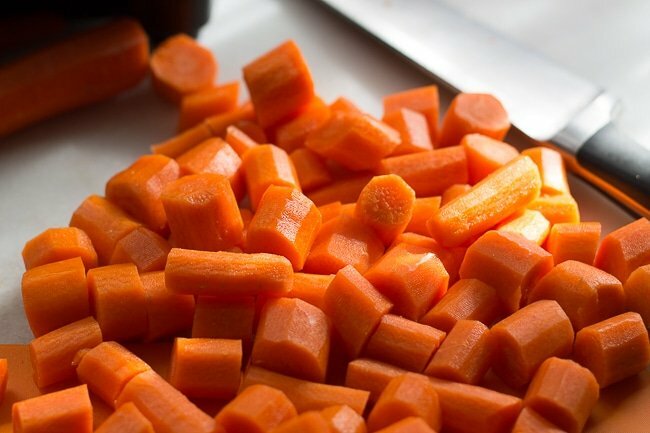 Peel and chop carrots into 2 inch pieces. Add to blender with 5 cups of water and blend for about 2 minutes. Place strainer over pitcher and pour mixture into strainer, allowing juice to fall into pitcher and carrot puree to remain in strainer. 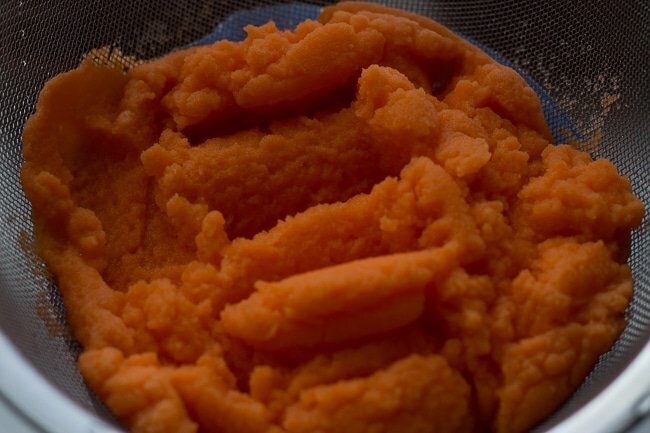 Discard (or save for another use) carrot puree in strainer. You will need a pretty good blender for this recipe. I love love love my Red Vitamix Blender that my hubby got me for Christmas. Feel free to add a good splash of rum to this recipe. Yes, I like to add rum to certain drinks, rum added to this one is really good. 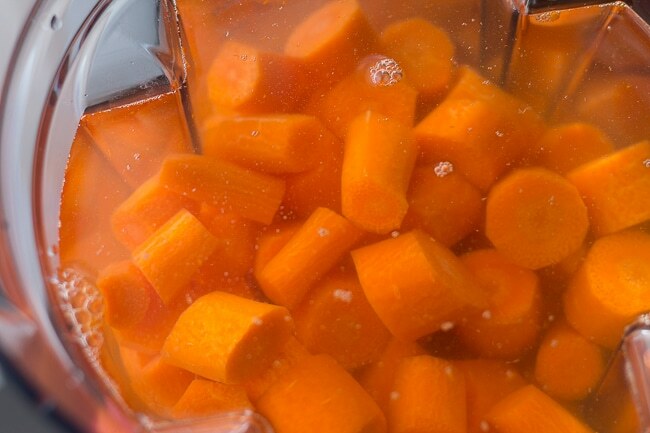 Place strainer over pitcher and pour carrot mixture in strainer. Allow to completely stain. 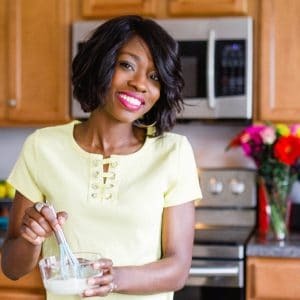 Want more Jamaican Recipes?? Check out my Instantpot Jamaican Cornmeal Porridge or Corned Beef and Cabbage – Jamaican Style. What a yummy way to refill your carotenes! You too?! I use to love carrots as a kid and would chill out with tv or a book and snack on them. My grandmother grew her own garden and had all types of vegetables and fruits and I helped with it. I thinks that’s probably why I loved vegetables so much back then and still do now. This drink sounds really good. If I had condensed milk right now I would so make this!